In our previous post we blogged about Karnataka PGCET Announcement and Application Form and now government officially announced the Admission/Hall Ticket for the students who are entering the PGCET for MCA and PGCET for MBA. Students who have applied for the Karnataka PGCET-2010 and who have not yet received any Admission ticket or Hall ticket yet, then you can download it from their official VTU PGCET website. Most of the students who are appearing for Karnataka PGCET-2010 have not yet received their Hall ticket after applying PGCET entrance exam. 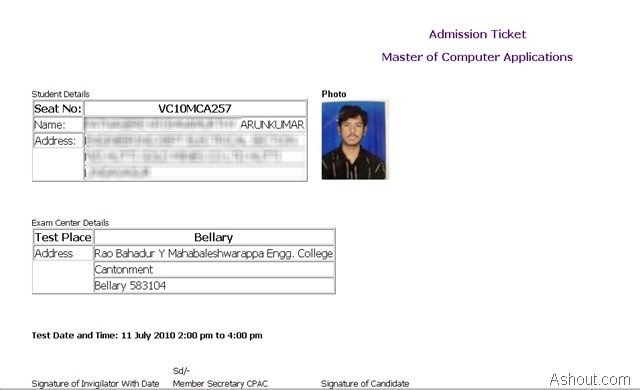 Even personally I have not yet got my Hall ticket for entering pgcet for mba and pgcet for mca, I have applied for both entrance exam, but still today I have not received my Hall ticket for Karnataka Pgcet entrance exam. Same thing happened to most of my friends and only few of my friends got their Hall ticket in their hand. Wait for few more days, if still you haven’t got your pgcet 2010 hall ticket then go to http://pgcet.vtu.ac.in/ and click on MBA/MCA Admission Ticket Available for download. After doing the above step, it will open in the new window. Choose appropriate options like which Exam you’re entering either MBA or MCA. And in the test place select your place where you’re writing exam (what you have selected in application form) and in the Student Name place enter only few character otherwise you may won’t get your hall ticket result when you searched in pgcet website. In Date of Birth leave it blank because sometimes you won’t get the result when you entered it. When I searched for my hall ticket in the official pgcet website by filling all the fields in the form, I won’t get any result. So, it’s better to search your hall ticket as I told you. See the below image you may get some idea. 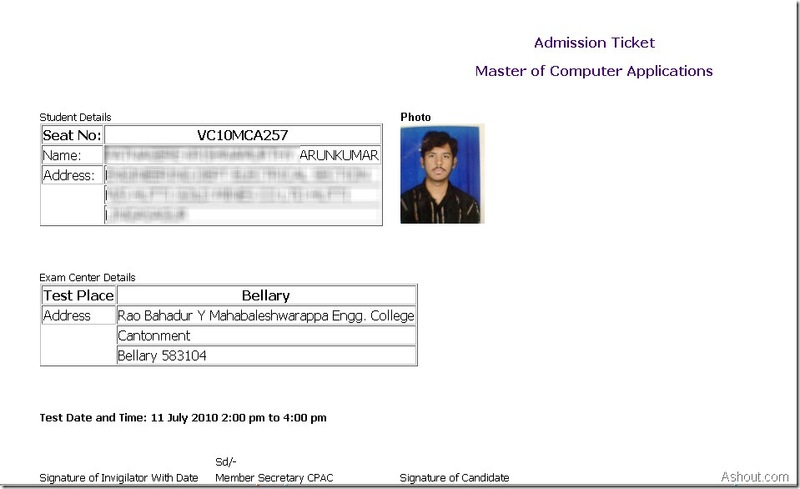 See the below image of my Hall ticket which I got in official PGCET website. After getting Hall ticket in the official pgcet website, take a print of it and we can use this printed Hall ticket as a replacement for the original PGCET Hall ticket. Make sure you have taken some relevant ID card (like Driving License, PAN Card, Voters Card, Passport etc.). If you have any problem regarding Karnataka PGCET-2010, then you ask me through below comment form. Sorry, we don’t know about gujarat pgcet. If you want to appear in karnataka pgcet then wait until next year announcement of pgcet. I don’t think Hall ticket will need at that time, anyway for the safer side go and download Hall ticket in PGCET website as shown in the post. If you have not yet received hall ticket then go and download your hall ticket in the official website as shown in this post. i tried downloading.but my name is not listed.i tried with all possible options.. it still din throw any search results.im worried. Don’t be scared, try by entering only few characters of your name, means if your name is “VARA” then in the name place enter “VA” and don’t put your date of birth and category option. Do try once. yes..did dat too.. no results.. 🙁 tried callin office at belgaum..but as usall no one answered! the site is lastly updated on 27th june/..are they gonna update again? In my opinion no, because they don’t have any official announcement about updating in future. Wait till some more days, you may recevie your hall ticket itself. I got my MBA hall ticket yesterday, but not yet got my MCA Hall ticket. hey..problem sorted.just got call from PGCET cell. itseems i din attach photographs. she asked me to send immediately.Thx anyways. n pray for me..hope i get it resolved! Reading this post fully I given some tips on searching hall ticket in this post and search once again.. If not fixed, call to pgcet cell they may help like vara problem. hey,i tried the way you have sujjested for others.m not getting my hall ticket.m worried…. Read this post fully first and then try, If you do so then neglect it. If you have not getting your PGCET hall ticket in that website, then it is better to call to pgcet cell because they may help you as in case of “vara” or try searching properly in that site. Don’t provide full details in that form give less infromation as possible so that you can get your result otherwise it will not show your name. hi… when will be karnataka pgcet 2011 apllications available? sir,still i didn’t get my application form etc so plz tl me what to do plz tell me solution.